Do you like sun, sand and surf? How about paragliding from sand dunes with views of pine forests as far as the eye can see? Oh, and the views include the Atlantic Ocean too. It may sound like something from a dream, but this is actually what it is like along the south-west coast of France. So, if you find yourself with a week on your hands, and you want action and adventure mixed with a chilled surf vibe (without heading to distant shores) we suggest you hop on the next flight to Biarritz and check out these three fab destinations! 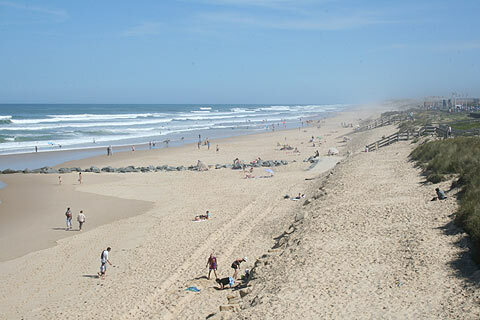 Just over 1 hour drive from Biarritz airport, you’ll find the fabulous seaside surf heaven of Contis-Plage. After the small and unassuming town, towards the beach you’ll be greeted by timber shack-style shops that look in danger of being swamped by the sand dunes. Among the shacks are purveyors of surfboards, fine foods, and of course fabulous beers. The feeling is laid back, rustic, and unassumingly cool. The beach is long, and even in high season, you can find yourself somewhere quiet to sunbathe, or find your own stretch of sea to take on waves that attract surfers from far and wide. To the right of the beachfront “town” you can find a new type of development rising from the sand. Weathered wood is replaced with modernist architecture, but still with a vibe that keeps true to the laid-back roots of the area. Only a huge sand dune separates these houses from the sea, which have private paths over the dune to reach the beach, and many are actually available to rent as a holiday let. Highlight: There is a restaurant bar on the other side of the rising sand dunes, overlooking the sea. It is open to the elements but perfect for replenishing lost energy after a morning or afternoon at the beach. If the sand dunes of Contis-Plage left you yearning for an even bigger beach, there is only one place to go – Dune du Pilat. The drive is just 1.5 hours through huge pine forests and along the coast. There is no way of explaining to someone how vast this sand dune is… sure, it is over 3 kilometres long, half a kilometre wide and reaches more than 100 metres above sea level – but can you really imagine that? 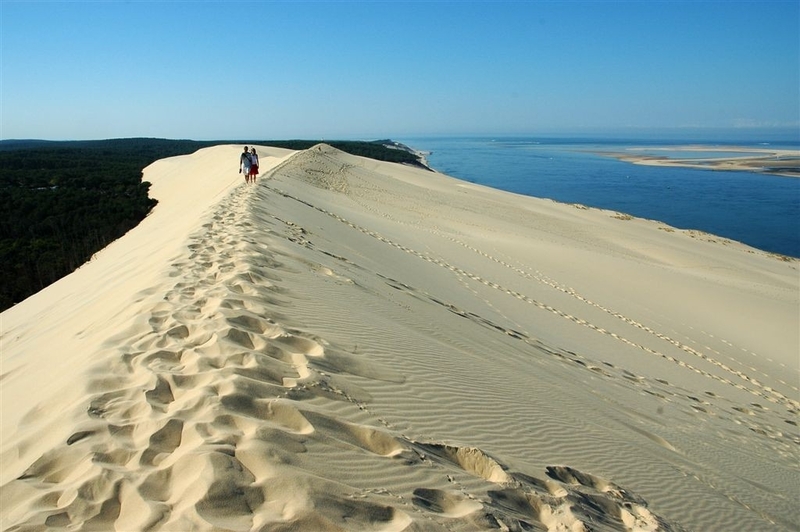 The best access to the dune is actually from Dune du Pyla campsite. You can choose to circumnavigate the dune to get to the beach, or take it on at a moderately easy level to get to the top. If you choose to attack the dune from the designated tourist spot, give yourself plenty of time. The ascent is breath-taking, and so are the views! Even the fittest don’t seem to get to the top in one go. Top tip is to take it easy, take some binoculars and use taking in the view on the way up as an excuse to have a rest. At the top, you’ll be rewarded with astonishing views. To one side, all you’ll see as far as the horizon is pine forest. The trees are huge, but you’ll be way above the canopy. To the other side, the Atlantic Ocean glistening in the sun. Highlight: Paragliding! The conditions are just perfect. Whether you book a flight yourself, or just come to watch others hanging around in the air, it somehow gives the dune an added sense of magnificence. The final paradise in this beach trilogy is Lacanau Ocean. While the town itself feels like an end-of-the-line tourist destination, it is simple, welcoming and has some amazing food on offer. It also has a big wheel if you really like that kind of thing, but what really attracts people is the long sandy beach and the near-perfect surf. The drive from Contis is just over an hour – Warning: do not confuse with Lacanau, a nearby, and very pleasant town bordering lakes and pine forests. 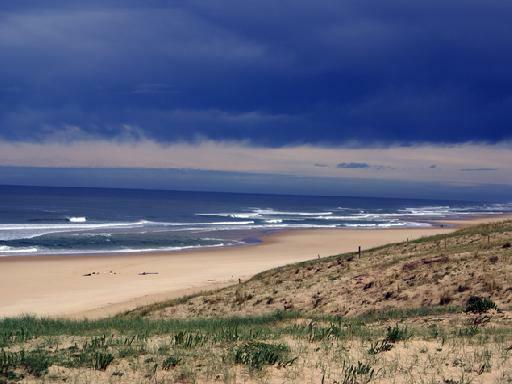 The beach here, and the aforementioned fabulous surfing conditions make Lacanau Ocean a prime spot for professional surfers to have some fun. The waves are good all year round, and all day long, but August is the time that Lacanau Pro comes to town, an annual surf competition that is also the oldest in France. Should you happen to be here at the same time as the event, you’ll be able to see just how surfing should be done as the top 44 surfers in the world take to the waves. Highlight: It is all about the watersports, and the best thing is that it doesn’t matter if you can surf or not, there is always a wave to suit. The shallow water means you can skimboard by the shore, bodyboard a metre or so in, paddle board a little further out, or go all out to catch the really big waves. This entry was posted in Fun, The places we've been, Travel Advice, Uncategorized on September 9, 2014 by worldwideinsure.